1. Will the tire talk stop? If Formula One’s tire manufacturer was a football manager surely they’d have been sacked by Christmas? It really is last chance saloon for Pirelli, having cashed in their chips before the mid-season break. F1’s up-and-down relationship with its tire manufacturer is nothing new, but it reached a new low in the first half of this season. You wondered whether Pirelli would have been better off sticking to calendars. There was the controversial Mercedes tire test and then the Silverstone shambles when a number of drivers suffered problems. Drivers, teams and fans lost confidence - and serious questions were asked. Pirelli’s advertising deal for circuit hoardings means no other manufacturer is likely to want to take over in a hurry, but it’s not going to be an easy return to action after the break as the characteristics of the Spa circuit make this weekends' Belgian Grand Prix one of the toughest tests for the tires. It’s going to be a great few months for the gossip mongers. Who has been spotted talking to who in the back of which garage? We could see as many changes in driver line-ups as changes of tires. Daniel Ricciardo is widely expected to be announced as Mark Webber’s replacement at Red Bull for next season. Another Australian, Ricciardo is seen as a natural fit after his time at sister team Toro Rosso. Kimi Raikkonen was in the frame for that seat, but there’s now speculation he could be returning to Ferrari for a second stint. There’s been a feeling for a while that Felipe Massa has been living on borrowed time, but is the "Iceman" - a world champion with the "Prancing Horse" in 2007 - the man for an Italian job? And what of Fernando Alonso? How much longer can the two-time world champion put up with a car that just doesn’t cut the mustard? On the flip side, how many more frustrated outbursts from the Spaniard will Ferrari put up with? There are also questions being asked about Roman Grosjean’s erratic performances for Lotus. Although the Frenchman does bring considerable financial backing, Nico Hulkenberg isn’t happy at Sauber and Kamui Kobayashi has Japanese backing and wants a return to F1. Watch this space. 3. How low will Button go? Even the most cynical British sports fan would have struggled to predict that Jenson Button would be a whopping 85 points behind his former teammate Lewis Hamilton after 10 races and sitting ninth in the drivers’ standings. The MP4-28 isn’t a car that will be going into the McLaren museum. It’s been so bad that team bosses have said they’ve ended development on it and are now in the business of damage limitation. Button has failed to finish on the podium so far this season - in fact hasn’t qualified better than seventh - and despite better showings in Germany and Hungary it’s not beyond the realms of possibilities that the 2009 world champion could finish the season 100 points worse off than Hamilton. 4. Will the Red Bull rampage come to an end? With Hamilton looking to have found his form can Mercedes stop the Red Bull charge given there’s 69 points between the top two teams heading into the second stretch of the season? Webber has already announced he’s off to Porsche and the World Endurance Championship next season and if he takes his foot off the gas and doesn’t clock up a few points here and there the Silver Arrows could have flown past Christian Horner and co before they know what’s happened. Mercedes have three wins and four poles from the last five races and have both drivers vying for podium places. If Nico Rosberg can avoid adding to the three non-finishes races, which marred his first-half term card and Hamilton’s improvement continues, there could be a different constructors’ champion for the first time in four years. 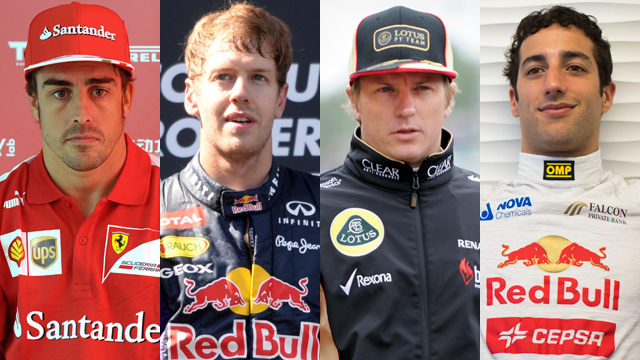 But surely Sebastian Vettel already has the drivers’ title in the bag? At this point last season the German was 44 points behind Alonso and still went on to claim his third straight crown. This year he’s got a 38-point lead over second-placed Raikkonen with nine races still to run. He’s got more wins, more podiums and more fastest laps than any other driver. But Raikkonen, together with Alonso and Hamilton, will be doing their utmost to stop him. There’s 225 points left to win and all three of his nearest challengers have been there and won the title in the past. Raikkonen will be looking for a fifth career victory at Spa on Sunday. He’s finished in the top 10 at every race since last year’s Bahrain GP, but will need to up his game in qualifying to keep up his fight. Ross Brawn has promised there’s more to come from Hamilton after his first victory in a Mercedes at last month's Hungarian GP. The 2008 world champion has scored more points than any other driver in the last three races as well as taking pole in each of them. And his fight with teammate Rosberg could push both of them up the rankings. The question is - how far? Why should there be only one tire brand allowed? That's like saying everyone has to use the same tennis racket. And why not widen the tracks so drivers can pass? It's so boring to watch someone take the lead and hold it the entire race while his partner blocks the cars behind. F1 needs to modernize. You seem to know little about F1 ! Please explain what you know that I do not know. No, it would be more like telling all ATP players to use the same string, not racquet. The F1 car is more of the metaphorical racquet. But I agree with you. While there have been some really good races this year I really feel that Sebastian Vettel and RBR is starting to ruin F1. I'm getting tired of wasting 2 hours watching Alonso and Raikkonen claw their way through the field every race while Vettel just cruises in first most of the time. I understand that most of the drivers are arrogant spoiled brats but Vettel and Hamilton really epitomize this and watching Vettel set records all because of Adrian Newey doesn't really interest me. I'm not too excited for the new rules next year but if it evens out the difference between Red Bull and everyone else then I can't wait. Aren't they going to a turbo formula next season and if so, what displacement? Also, what network (in the states) is carrying TV coverage? Haven't been able to find it all year.